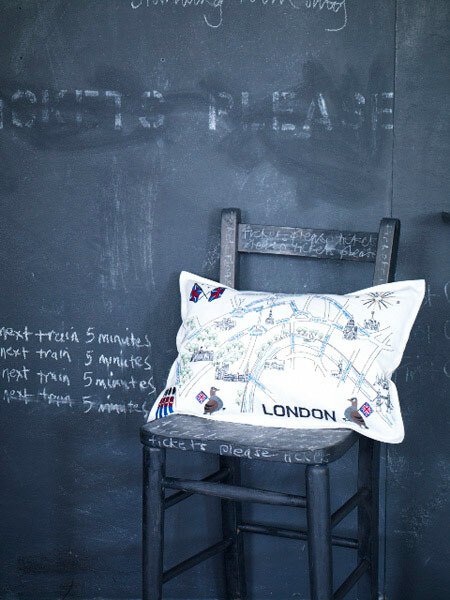 I spotted these gorgeous pillows today from Barbara Coupe, a textile designer in London who specializes in hand-embroidered goods that are made in England, and had to share them. The typography-as-decor continues to be a strong trend here on this side of the pond -- in fact, it has enjoyed quite a long run both in parts of Europe and in the US. Certain trends definitely have staying power and end up running a lot longer than others, which is of course largely due to supply and demand so if consumers are drawn to a certain trend and don't tire of it easily, it can endure for some time -- and rarely, though it has happened, even becomes a classic style, a must-have in every home. Other trends disappear forever once they've had their run, but then others circle back -- like the revival of wallpaper. After it's popularity waned in the 1990s, it made a huge come back about five years ago and today it's a staple in some of the most drool-inducing rooms in the world. 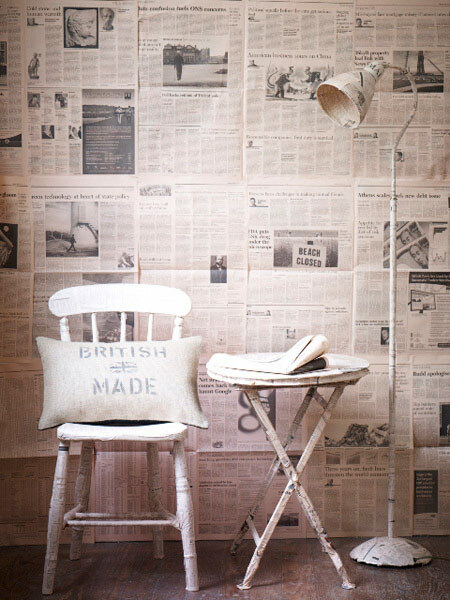 With growing options from hand-blocked to hand-painted, eco, and beyond wallpaper seems to have staying power so if it is does start to lose its mass appeal in a few years, no doubt it will circle back again for the next generation of young designers to embrace as a hot new trend all over again. I find trend watching quite fascinating, especially now that I live abroad, because lots of what we see over here makes it to the states a year later but also vice versa as the US starts many trends on its own -- like the whole blogging trend and handmade market trend -- I credit them mostly as being largely promoted in the states before the rest of the world caught on so it's not always Europe dictating movements in fashion, art and design like so many assume, America plays a huge role in up-and-coming trend movements as well. 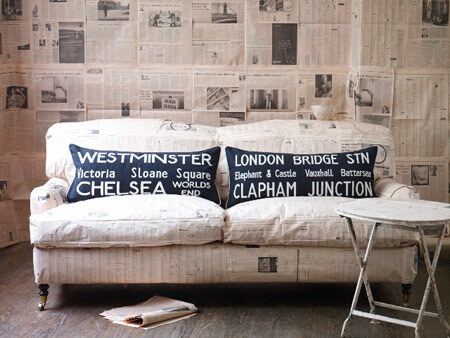 But back to lovely Barbara Coupe, who made these stunning cushions that definitely have anglo-appeal. 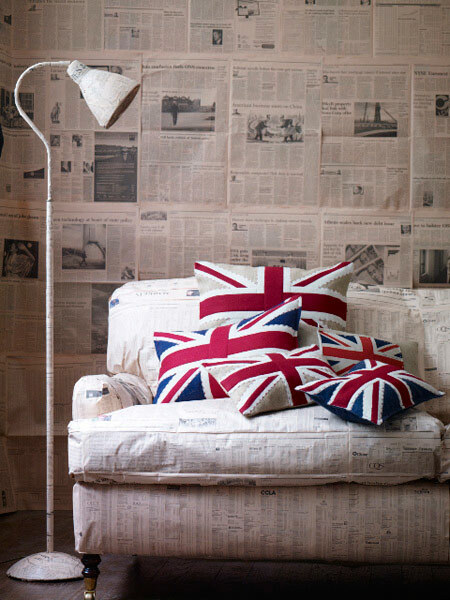 Many people, even those who have no English ancestry, love the Union Jack as a motif and of course this has been a trend in decor as well hasn't it? I've seen Union Jacks popping up in design for some time now. I don't think we have a US-equivalent using the flag, if we put a US flag on anything it is usually attributed to either the Fourth of July, being a fan of the New England Patriots or associated with the Ralph Lauren/Polo brand. To me anyway. It would be cool if a designer could modernize the US flag somehow, if that is even respectful to say, and make it more interesting to show in the home because currently it just doesn't seem to find it's way to sofas in our favorite magazines as cushions or wall hangings like the Union Jack, does it? I'd like to thank new blogger, Emily Peck, for writing about Barbara Coupe and pointing me to her blog today - it was nice to hear from you! Thank you for the tip!